maybe add a SMS indicator on the rocket or body. customizable droid's size and color. Great wallpaper however it drains the battery. I would suggest adding a disable until phone is unlocked setting. Superb Work. Thanks for this. Looks really Great. I have an Eris with Froyo and Jumpgate isn't available in the Market. Any ideas? This looks awesome! 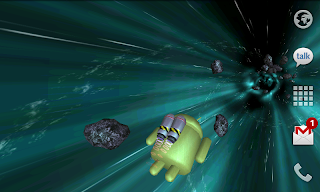 I would definitely purchase this if there were an option to disable the android, and just have the warp tunnel effect. I'll definitely get on doing a few of these suggestions -- letting you tweak his color and so on. It might make more sense to have a separate listing without the Android as a centerpoint... or maybe let you pick the Android, a space ship, or nothing at all? Steed - I've been using this for the last few days and it doesn't even show up on the battery usage list. It already sleeps if the home screen isn't active. Another great (and purchased!) LWP! I'm with the having the option of removing the Android as well. How about making the Asteroids optional as well (0 = no asteroids)? The clean warping effect is really nice. Just bought this, really cool and cute! However, I've not seen this "Turbo Boost" feature. How does it look like? I only see the wave and the barrel roll. Hope you add more actions in future! And an option to choose the action.